Publication date: 29 April 2004. Can you think of how you might use this software? If you send your freelance copy to someone who doesn't use it straight away and doesn't say they want to use it, you can use Mail-Lock to give it a destruct time, and send it to another place without waiting for a reply from the first one, knowing it's GONE off their screen. Personally, I have used Mail-Lock for several different reasons during business. I'll have you know that I only send copy to people who have agreed to pay me darn good money for it, sonny. But Mail-Lock still looked interesting, so I downloaded the viewer and fiddled about. Mail-Lock absolutely cannot do all that Treasure Coast Software claim. It will effectively prevent people accidentally forwarding e-mail to people who shouldn't be seeing it, but it won't stop people from forwarding or printing e-mails, if they really want to do it. 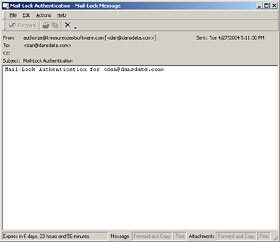 This is obvious, because Mail-Lock displays the e-mail text on the screen of your computer. If you can read/watch/listen to something, you can copy it. What surprised me was how easy it was to do something Treasure Coast said was impossible - copy a Mail-Lock message. Mail-Lock disables the clipboard globally while one of its messages is open (regardless of whether you're trying to copy from the Mail-Locked window; nothing can copy while a Mail-Lock window is open). This is what's supposed to stop you from copying or printing a Mail-Locked message. But it's actually trivial to get a copy of what's in the window; it took me about two minutes to discover that while pressing Print Screen with a Mail-Lock window open somewhere won't give you anything on the clipboard, it will still let you grab the screen with any of a number of dedicated applications. I used GrabClipSave. This is just the authentication message, but it's meant to be as copy-locked as any other default Mail-Lock message; you get the idea. It's not hard to grab even a big Mail-Locked message as successive large window images, and then you can turn it back into text with any OCR software, in seconds. Now you've got your plain text, ready for e-mail forwarding, printing as a banner to trail behind an aircraft flying over a city with a population of 25 million, et cetera. I would also not be at all surprised if Mail-Lock's "128 bit encrypted" .mlk format is not particularly secure. If regular Crypto-Gram reading has taught me anything, it's that crypto systems that aren't subject to public scrutiny have a good chance of being about as secure as a damp paper sack. "128 bit encryption" is not some monolithic thing that means the same thing wherever it's mentioned. Different encryption schemes provide quite different amounts of crack-resistance from a given keylength. Different implementations of similar cryptographic ideas can be quite different, as well; for instance, it's quite common for lousy crypto systems to use big keys that, thanks to a poor key generator, only ever occupy a small area of the total keyspace. This is the same thing that happens when you use a password for Windows or for a Zip archive, but make it only a few characters; the set of three-character passwords is not large, and a brute-force cracker that spools dumbly through all possible passwords starting at one character will crack any three-char password before the person running it has time to blink. If Mail-Lock ever becomes really popular (which doesn't seem likely right now - has any real computer publication even reviewed it? ), I'll bet there'll be a selection of small, fast crackers for .mlk messages (fresh or "expired") available via all the usual wretched hives of scum and villainy. I have no faith whatsoever in any of Treasure Coast's claims, given the extreme simplicity of copying what they claim to be uncopyable. Also, if the person sending a message just plain screws up and sends it to pressreleases@everynewspaper.com instead of cfo@mydodgycorp.com all by his own dumb self (as has happened many times), I doubt Mail-Lock will help, as the cheerful journos at the other end download the reader, register their addresses, and read that there message. Well, unless they don't have access to one or another version of Windows, in which case they won't be able to read it at all. I am putting together a new system for a friend, and the case has USB ports on the front, but the motherboard only has pins for USB 2. Do you know of any special hacks that will let me plug an old USB 1 port into the USB 2 pins on the motherboard? And for my second question, we're keeping my friend's old hard drive and upgrading just about everything else. Unfortunately, that hard drive has Windows 2000 on it, which does not respond well to motherboard/processor/memory/vid card upgrades, and I need to perform a "repair" on the installation. This seems to require the administrator password, and you can probably guess by now that my friend doesn't have a clue what his password was. Do you know of any bootable-cd-style password crackers, or any other viable solution to this dilemma? The USB 1 pins and cables should be the same as USB 2 ones - or, at least, no weirder than the different pinouts and cable arrangements used before USB 2 came along. USB 2 cables are the same as USB 1 cables, so cables to front ports should be fine too. I've written before about NT-series-Windows password-cracking. The procedure's much the same for Win2000 as it is for WinXP. I was poking through your article list when your DIY UPS article caught my eye. I spent some time in the US Navy as an electrician and have been toying with the idea of a whole house UPS ever since, so I found your article very interesting. Some subsequent searching found this page about the "I2K Power Inverter", which fired my imagination further. I thought you might be interested. I have been toying with the idea of a high power charger-battery-inverter rig where the charger could combine a number of power inputs. It would be interesting if you could charge the batteries from the power grid, a windmill generator, and/or a photovoltaic array. Of course, that complicates things significantly. The I2K looks like a decent piece of gear, if you can spare the time to build it. Pre-built 24V, 1500VA modified square wave inverters are pretty darn affordable these days, though; even sine wave units don't cost that much any more. The I2K looks rather cleverer than the usual Chinese-made cheapies (I like the idea of a firmware upgrade to sine wave operation! ), but there's a lot to be said for just buying the things off the shelf. You can deal with the high startup surge current of refrigerators, laser printers and such by just giving them their own dedicated cheapie inverters. A 1500VA inverter, for instance, should run any domestic fridge ever made with no trouble (some houseboat residents really like full-sized appliances...); less than 1000VA should be fine in most cases. I have a six cell 7.2 volt 1700mAh NiCd battery pack from a relatively unknown manufacturer. Works fine enough in my 1/10th scale RC car. But anyway, I have another 1500mAh 7.2 volt NiCd pack from a more well-known manufacturer. I have a four hour charger (just a power block with a wire and the connector, without LEDs on it or any other indication of life on it) that came with the 1700mAh pack, and it charges the 1700 fine within those 4 hours. I want to be able to charge my 1500mAh battery. How long would it take to charge using the same charger? Or should I just forget the idea and save up for a normal hobby-class charger? The charger you've got could be a basic peak detecting charger, which'll work as well on the 1500mAh pack as it does on the 1700, but if it's more than a couple of years old then it might not be. Four hours is fast for a trickle charger, but slow for one of the dreaded old "charge cords" that just hooked 7.2 volt batteries straight up to 12 volt car batteries (and, on various occasions, thereby set fire to the battery and then the car...), so I don't know what it is for sure. If it's a peak charger, you'll definitely be fine. In any case, there are two ways you can pick the end of any NiCd charge, when you're using any vaguely decent charger. They also let you check to see whether an automatic charger is actually doing what it's meant to do. Simple, unsophisticated way: Put your hand on the pack. If the pack's much warmer than ambient, it's charged. NiCd packs don't get very hot even when they're charged really hard, until they're full; then their temperature spikes. Fancier way: Be a human peak charger. Buy the cheapest little entry-level digital multimeter you can find ($US5 will get you one), and hack the charger wires so you can monitor the voltage across the battery with the multimeter. The voltage will climb steadily through the whole charge, then drop slightly (by hundredths of a volt) as soon as the charge is complete. This voltage drop is what peak-detecting smart chargers actually detect, but it's perfectly possible to spot it by eye; just terminate the charge as soon as that first hundredth of a volt drop's happened, and you'll have as good a charge as any smart charger can give you. Neither of these techniques is much use when charging NiMH cells, by the way. NiMH packs get hot while they're charging, even when charged relatively gently, and the NiMH chemistry doesn't peak, either; its voltage just plateaus off as the pack fills up. I was wondering if you have seen these Airsoft tanks? Do you think they would clear Customs to Australia? I haven't seen those tanks in particular, but there are quite a few of them on the market; they're all very similar to the Marui one I review here. I don't think the Chinese made off-brand versions are actually significantly worse than the Marui-branded ones. I'd bet a small amount of money that, despite the illegality of Airsoft guns in Australia, it'd be no problem importing those tanks; my Marui tanks from HLJ swished through Customs. If the Customs declaration label on the box says "Airsoft Eye-Shooting Dangerous Toy" then you could be in trouble, but if it says "radio controlled toy" or (my favourite for Toy Things That Shoot) "plastic model", you'll be fine. The Australian Airsoft ban is focussed on Airsoft guns, primarily because of their realistic appearance, not their danger. Nobody's ever held up a bank with a toy tank (well, if you don't count Malcolm). I live in the Netherlands, and fuel is ridiculously expensive here. One litre of 95 octane costs €1.255 at the moment. In the last couple of weeks, Shell have started a big campaign on TV and radio about their so called "V-Power" fuel. According to their commercials, their new fuel improves the power and response of your engine. This fuel is also excitingly expensive, at €1.30 per litre! Normally I'm very skeptical about these things, but I fell for their marketing hype and filled up the tank of my Kawasaki ZX6R with V-Power fuel. I have not driven enough kilometres with it yet to give a verdict, but Shell claims that this fuel was developed together with Ferrari and Ducati to give motorists a cleaner engine and more power and responsiveness when they need it, for the ultimate driving pleasure. According to their TV commercial, it compares to "Adrenaline for your car". "Shell V-Power improves power and acceleration of your vehicle through performance enhancing components in the fuel. Shell V-Power has excellent cleaning properties that keep your engine in top condition. This way more energy is extracted from every drop of fuel. It is the first sulphur free fuel on the Dutch market." As far as I can see their advertising campaign has all the properties of advertising for "wonder products". Big claims with no scientific backing. So here's my question: Can Shell's claims be trusted or not? On the endlessly-interesting subject of fuel prices - here in Australia, we enjoy very cheap petrol, by the standards of every "Western" nation but the USA. It's around 90 to 100 Australian cents per litre at the moment, depending on moon phase and the type of petrol it is. 95 Aussie cents is about 70 US cents at the moment, or about 58 Euro cents. Then again, Australia does have 190 times the land area of the Netherlands; we sometimes have further to drive! Head for the pumps in New York State today, of course, and you'll pay something in the vicinity of 50 US cents per litre. And probably get to hear people complaining about that. Judging by the results of Web and Usenet searches for V-Power fuel, Shell haven't yet started promoting this product in any English-speaking countries (a reader's now pointed me to this English page for Shell Singapore). But according to this test, V-Power does a whole bunch of nothing when you just squirt it into a stock automobile. Because it's 100-octane, V-Power would allow an engine to run at a higher compression ratio than lower-octane fuel. This could give results less underwhelming than those found above. The difference is still likely to be very small, though; there just ain't that much difference between even 95 and 100 octane, much less 98 and 100. And you can't, of course, change the compression ratio of a given engine by just tightening a bolt or swapping a chip or something. Realistically, the only way compression ratios change is by slowly dropping as an engine wears out. But if you're thinking of adding a turbocharger or supercharger to your car, or if you've got a high-performance car whose engine is already "knock limited", higher-octane fuel can still be an essential part of the performance recipe. Higher-octane fuel lets you run a higher compression ratio because it is less prone to detonate when compressed; turbos and superchargers pack more fuel/air mixture into the cylinders in the first place, and thereby create the same effect, from the fuel/air mixture's point of view, as an engine with a higher compression ratio. Note that it's still pretty unlikely that an unmodified vehicle will perform better if you feed it fuel with a higher octane rating than whatever's recommended in the manual. If high-octane fuel isn't commonly available in your country, high-performance cars sold in your country will probably be detuned to run well on the highest-octane fuel that's reasonably easy to find. So you'll probably have to fiddle with the car yourself if you want it to run any better on higher-octane petrol. Many cars today can cope with lower-octane fuel (by advancing their ignition timing), which means they run better on higher-octane. But it's not likely that exotic superfuel with unusually high octane levels will give any benefit, unless you fiddle with the engine management system. Perhaps the secret engine-cleaning and friction-reducing herbs and spices in V-Power are worth something, but since Shell's claim of more power without any engine tweaks would appear to be, unsurprisingly, rubbish, I see no reason to suppose that there's anything to the other claims either. The notion of fancy fuels giving better performance is certainly not nonsense; many car and motorcycle club members who run what they rode to the track are used to being howled past in the straight by something with Elf Racing Fuels stickers on it. If you know you're going to be run high-octane fuel (the current F1 regulations allow for fuel from 95 to 102 RON, but I doubt they fill up with 95 all that often...), you can use a very high-compression engine, crazy turbocharging, whatever, and go for it. Road-going automobiles that can't run from anything below 100 octane without pinging are, however, not very practical. I don't think anybody with an engine that's set up for lower-octane fuel can expect V-Power to have anything more than a placebo effect. The excellent Tony's Guide to Fuel Saving site has a page about fancy fuels, here. I see that the Smart car will be coming to America. Eventually, anyway. When I've visited Europe, I've seen lots of Smarts. They look great, and they sure can park anywhere. I note that they sell them where you live, too. What do you think of them? Are they a great nerd car? I suspect you think Smarts are cool because you never had to drive one. I haven't tried one out either, mind you. But the car reviewers, at least here in Australia, really don't like Smarts. If the things were dirt cheap then they'd be worth considering, but they cost as much as a quality Japanese hatchback (which I, for one, don't have that much trouble parking...), and by all accounts are far, far nastier to drive. The roadster doesn't escape unscathed, either. I did consider buying a Smart at some point (not in the near future, since my mighty '95 Pulsar's just fine at the moment), but now am most certainly not. The two-seat Smart costs rather more than half as much as a basic Mercedes-Benz A-Class, in this country. That's just ridiculous, for what the Smart is. In countries that give tiny cars tax breaks (wanna bet whether the USA will?) and where fuel is very expensive (which it isn't going to be in the States for a long time, if ever), there's more justification. But I think even then the Smart needs some serious upgrades to be a sensible purchase. Maybe I'll just get a Prius.